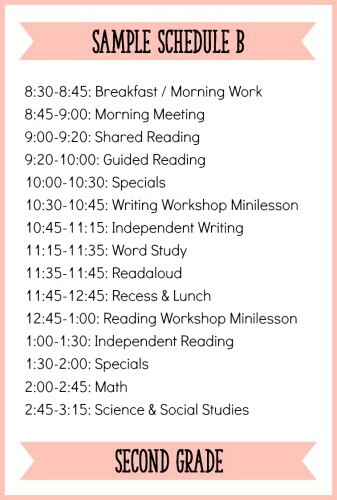 When I began teaching second grade, I struggled a bit with my schedule. 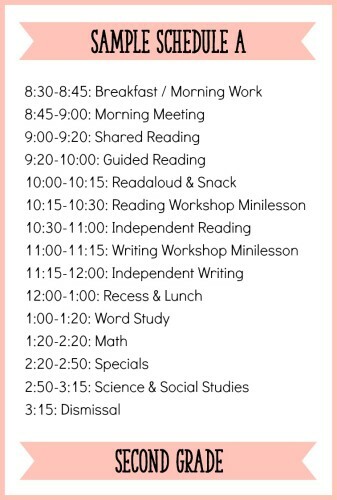 I was moving up from Kindergarten and just wasn’t sure what a daily literacy schedule should look like for second grade. After some trial and error, I figured out how to structure my literacy block in a way that worked for my kiddos and me. 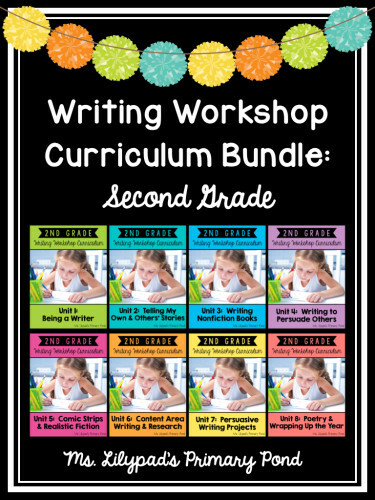 In this post, I’ll share with you the components of my second grade literacy block and some sample schedules. 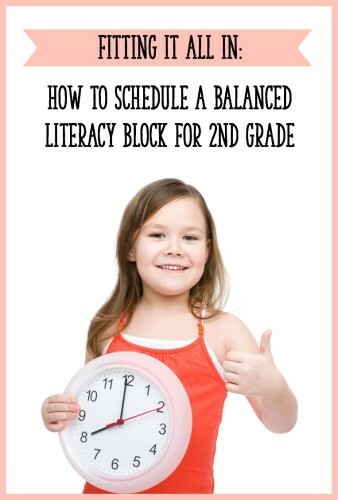 Before I get started, I do want to say that there’s no one “correct” way to set up your balanced literacy block. The best schedule is the one that meets the needs of you and your students. Also, I love hearing about how other teachers schedule their days, so please comment at the end of the post! Shared Reading (20 minutes): This is when I read aloud a text that students could all see clearly and follow along with. Most of the time I used a grade level appropriate picture book and projected it under the document camera. Students sat on the rug so that they could clearly see the words. Other times, I used a story from the old basal reading series, and students each had a copy of the textbook in front of them. We typically didn’t get through an entire text in a single shared reading lesson. I paused frequently to discuss ideas, comprehension strategies, and vocabulary with students, and I tried to include lots of “turn and talk” opportunities. 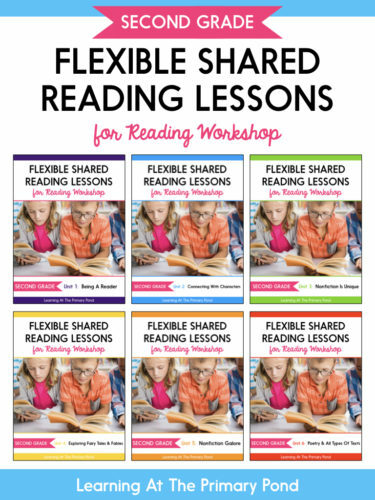 Click here to read more about the shared reading lessons I use. Guided Reading and Independent Work (40 minutes): During this block of time, I met with students for guided reading (2 groups total) while the other students worked independently. 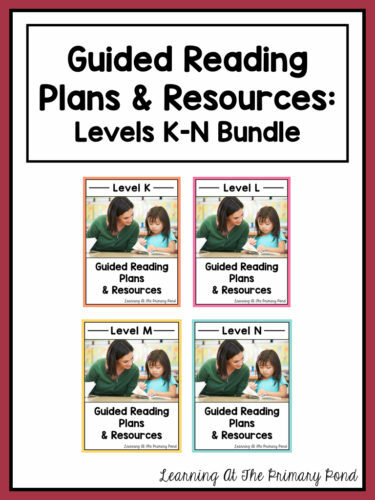 For my guided reading instruction, I provided students with scaffolding so that they could read texts at their instructional levels (slightly harder than what they could read independently). The students who were not meeting with me responded to the shared reading text in writing. They read or worked on other seat work when they were finished. Readaloud (10-15 minutes): Typically, I read aloud part of a chapter book or an entire picture book to my students. Independent Reading (25 minutes +5 for sharing time): Students read independently, while I conferred with kids individually. Sometimes, I met with a small group of readers who had similar needs. After independent reading time, we came back together as a group, so the students could share about their reading with a partner or the class. Writing Workshop Minilesson (15 minutes): I taught a brief, focused lesson on a writing (or grammar / language arts) skill that students could use in their own writing. I structured my writing units by genre, so whatever skill I taught was related to that genre. Independent Writing (30 minutes + 5 for sharing time): Students wrote independently, and I conferred with kids individually. After independent writing time, we came back together as a group so students could share their writing with a partner or the class. Word Study (15-20 minutes): I taught Words Their Way or another phonics program in small groups. I typically met with 1 group per day to introduce a phonics/spelling pattern. At the same time, other students worked independently with their assigned words. It takes some time to set up, but differentiating word study has been super effective with my kids in the past. 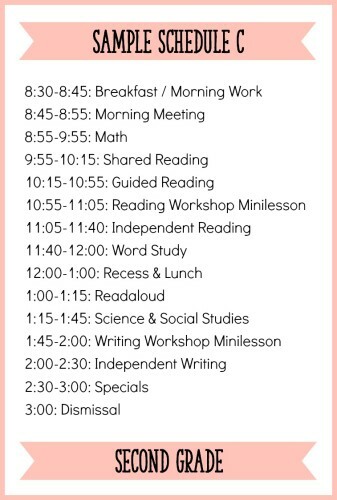 Even though I generally followed one of these schedules, our school day didn’t always look like this throughout the entire year. I love to teach integrated thematic units that engage kids in learning content area material through literacy activities (i.e. reading about and writing about insects). At the beginning of the year, it’s great to establish a routine that provides kids with consistency. But as the year goes on, I think it’s completely fine to deviate from that schedule. Literacy learning doesn’t always fit nicely and neatly into a box!